Forget signature bakes and technical challenges, the ultimate baking competition is returning to the Gilchrist. Following the success (and sheer deliciousness) of last year’s competition, PGR & Postdoc Bake Off is coming back to UofG! We know UofG PGRs are extremely talented- but can you bake your research? We don’t mean hiding your latest draft under a pie-crust or lining a Bundt tin with conference proceedings. This October, we’re challenging PGRs and postdocs once again to bake something connected to their research and provide a brief paragraph explaining that connection. 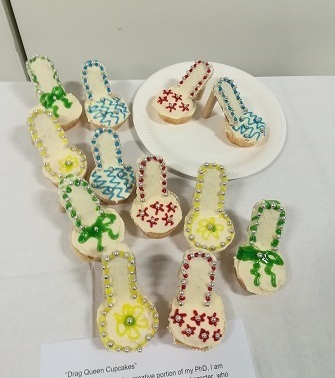 Last year’s competition saw cakes shaped like, and inspired by research connected to, the zika virus, sheep, and dictionaries- not to mention a spectacular representation of the human gut. Whether you’re a historian with a medieval bread recipe that puts Paul Hollywood to shame, a physicist with a Genoese sponge particle accelerator, or a zoologist crafting your own pastry menagerie, we want your bakes! Join us in the Gilchrist on Tuesday 9th October at 5pm for the showstopper challenge to end all showstoppers. Your bakes will be judged by a panel of judges as well as an audience of expert consumers of baked goods (fellow UofG PGRs and postdocs) according to look, taste, and how relevant your bake is to your research. If the chance to show off your skills, support fellow PGRs and postdocs, and try some delicious bakes isn’t enough, there will also be special prizes on offer for a winner and runners-up, including Amazon vouchers and appropriately baking-themed goodies. All bakers participating will receive their own custom Team UofG apron for future research baking endeavours. To enter as a baker please send your name and a paragraph explaining what your bake is, and how it is connected to your research to Cia Jackson by Monday 1st October. *Please note- all bakes must be made before the competition and brought to the Gilchrist. You will not be baking live on campus.